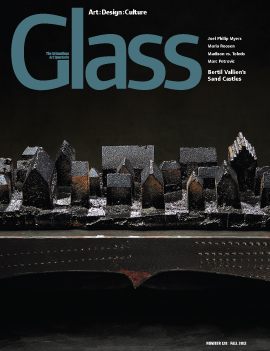 The Corning Museum unveils plans for ambitious new gallery wing; Alison Kinnaird's engraved window debuts at the Scottish National Portrait Gallery in Edinburh; In Memoriam: U.K. glass pioneer Charles Bray (1922 - 2012); Book Report: Color Ignited: Glass 1962 - 2012 by Jutta-Annette Page, Peter Morrin, and Bebert Bell; New Technologies in Glass by Vanessa Cutler; and Maestro: Recent Work by Lino Tagliapietra by Claudia Gorbman; flameworker Carrie Fertig's genre-breaking performance at the International Festival of Glass in England; the Bellevue Arts Museum's record-breaking fundraiser auction. Jessica Jane Julius at the Philadelphia Museum of Art; Anja Isphording at Heller Gallery, New York City; Isabel De Obaldia at the Museum of Art in Fort Lauderdale, Florida; Marianne Weil at Kouros Gallery, New York City; group exhibition at Museum Gallery, Whidbey Island, Washington. Artists Jamie Gaul and Hadassa Goldvicht were selected as the UrbanGlass 2012 Van Lier Emerging Visiting Artists; search begins for new executive director as Dawn Bennett resigns after 11 years. A new series of bird figures represents a technological breakthrough that has freed Marc Petrovic to encode complex patterns into work that offers conceptual and visual depth. Bertil Vallien's pioneering work in sand-cast glass sculpture has secured his stature in Studio Glass even as he remains a star designer at a glass factory in Sweden. Introduced to glass as the design director of Blenko Glass Company, Joel Philip Myers pursued individual expression in the material, eventually leaving the factory in pursuit of a rich artistic and academic career. Maria Roosen's collaborative approach to glass art taps deep material knowledge to realize her unique biomorphic forms. The real birthplace of Studio Glass is 400 miles west of Toledo.